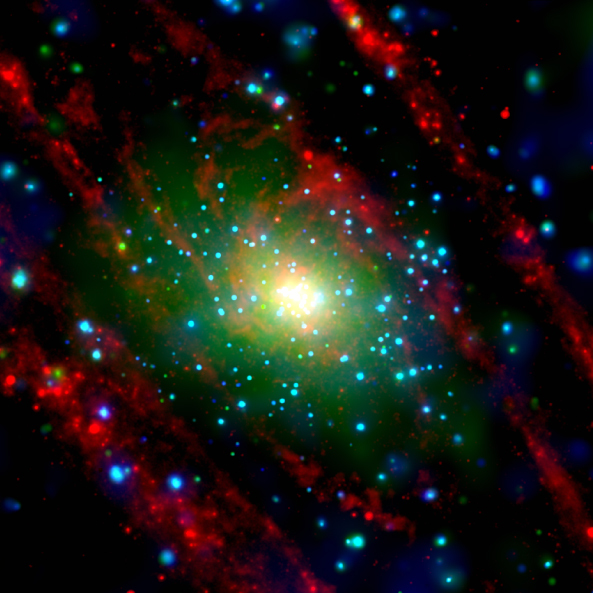 This color-coded Chandra image (red/low energy, green/medium energy, and blue/high energy X-rays) shows the central region of the Andromeda Galaxy, a.k.a. M31 where a diffuse, X-ray emitting cloud of hot gas was discovered in the midst of a collection of point-like sources. 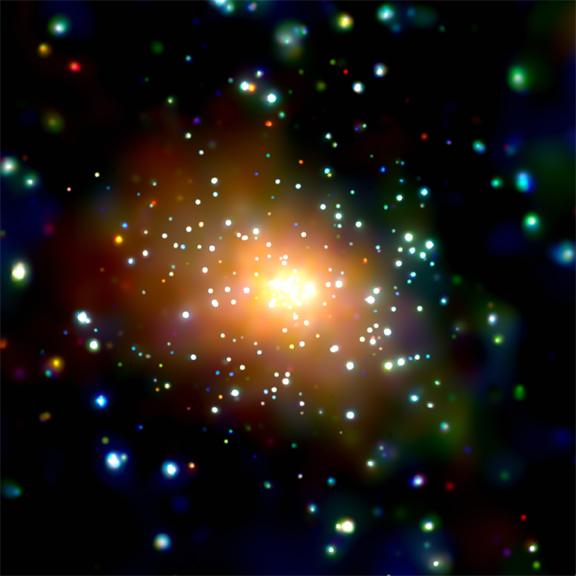 Analysis of the X-ray data shows that the point sources are associated with binary star systems that contain a neutron star or black hole that is pulling matter away from a normal star. As the matter falls toward the neutron star or black hole, it is heated by frictional forces to tens of millions of degrees, and produces X-rays. The diffuse X-ray cloud is due to gas that has accumulated in the central region and been heated to millions of degrees, probably by shock waves from supernova explosions. The energy input from the supernovas could also be driving gas out of the central region. This process may affect both the shape and evolution of the galaxy by depleting the raw material for the formation of new stars and preventing more gas from accumulating there. Andromeda, a large spiral galaxy much like our Milky Way Galaxy, is relatively nearby and can be easily seen with binoculars in the autumn sky. The galaxy's central region is called the galactic bulge because the stars form a ball a few thousand light years in diameter that extends above and below the disk of the galaxy. References Z. Li and D. Wang, 2006, 208th Meeting of the American Astronomical Society, Calgary, Alberta, Canada.